When looking at the current state of our local Santa Barbara real estate market, we see that it is changing from what it has been in the past, one may ask, Is something wrong? When actually what we may be experiencing is the return of a “Normal Market”. Properties are still going into escrow and most successfully close. There are still many properties receiving multiple offers, which indicates that there are active buyers out still in the market to buy homes at market value. 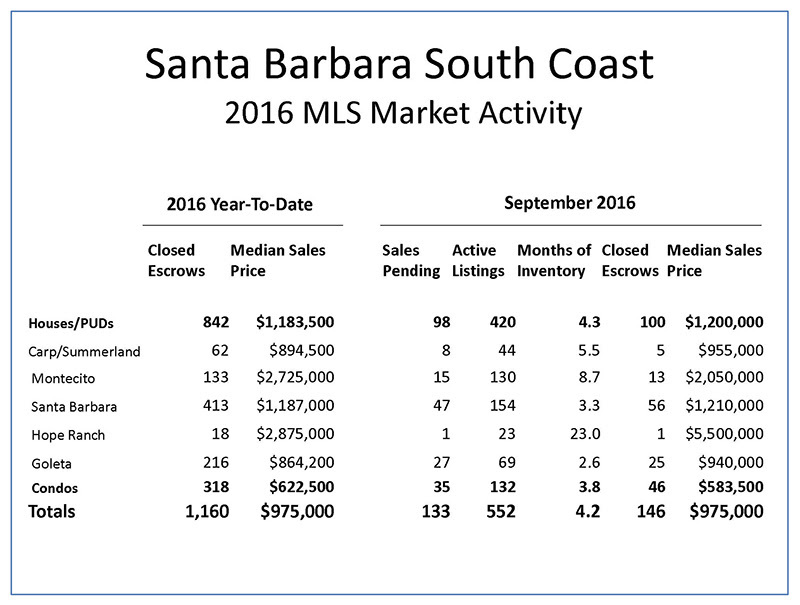 The data reflected in this update encompasses Carpinteria through Goleta as reported in the Santa Barbara Multiple Listing Service. When mentioning “houses”, it refers to single-family homes and properties in Planned Unit Developments (PUD). Reviewing the graph below labeled “Number of Sold Listings” primarily focusing on houses, we see that 2012 had the third highest number of sales in this reporting period. (2012 was the beginning of our current up market cycle.) In 2008, this was during a down market so the number of sales is quite low and 2009 was worse. In 2004 was the second highest number of sales in this reporting period. 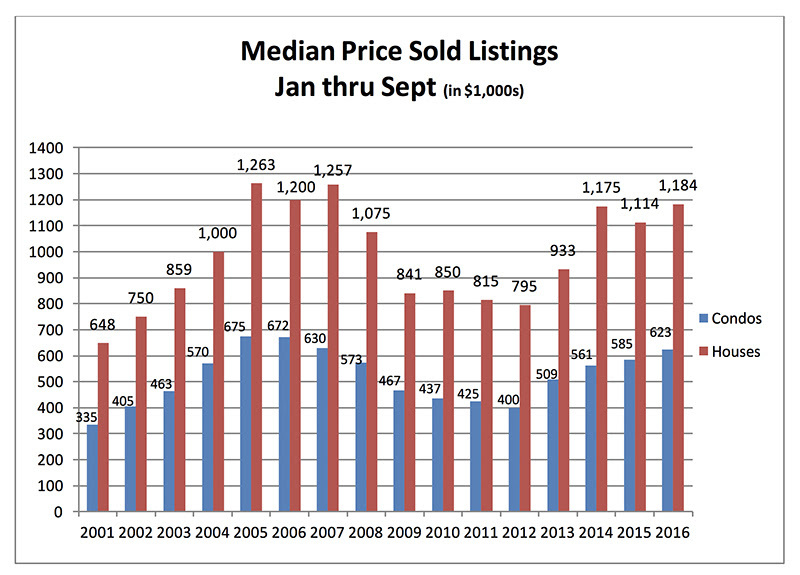 The graph below titled “Median Price Sold Listings” compares the median price over the last 16 years. The median is the price in the middle in which half of the sales were less than this price and half of the sales were more than this price. Keep in mind that the median price is just a measurement tool and is not indicative of what any individual house should be priced at. Now that the graph reflects nine months out of the year, we should be seeing a more accurate median for these properties. Even though fewer houses sold this year compared to last, the median price has gone up over 6%. The median for houses is very similar to the median in 2006. As for condos, note the roller coaster effect on the graph from 2001 to the present. The median price for condos has consistently gone up since the end of the recession. It also shows an increase over 6% compared to last year. A 6% increase reflects a calm, active market for both houses and condos. The chart below labeled “Santa Barbara South Coast” provides you with detailed information on specific areas within our coverage area. This provides both year-to-date and the information for the past month; in this case, September. The Months of Inventory (MOI) are higher compared to the previous quarter. This is a figure that indicates the amount of time that it would take to sell all of the existing inventory in an area without adding any additional units. In the above chart, the MOI for Hope Ranch may be inaccurate due to the small number of listings. As a general rule, anything under three months of inventory is considered a seller’s market. Goleta Valley has been in this range for quite a while, but has gone up almost a point since the last quarter. Carpinteria has gone up almost two points since the previous quarter. Condos have also gone up almost a full point in the same time. One of the reasons for the higher MOI’s is that more properties have come on the market compared to last year. The difference is up about 4%. Also, at the beginning of 2016, there were 250 Active Listings and as of the end of September, there are 420 Active Listings of houses. This is an increase of 68%! 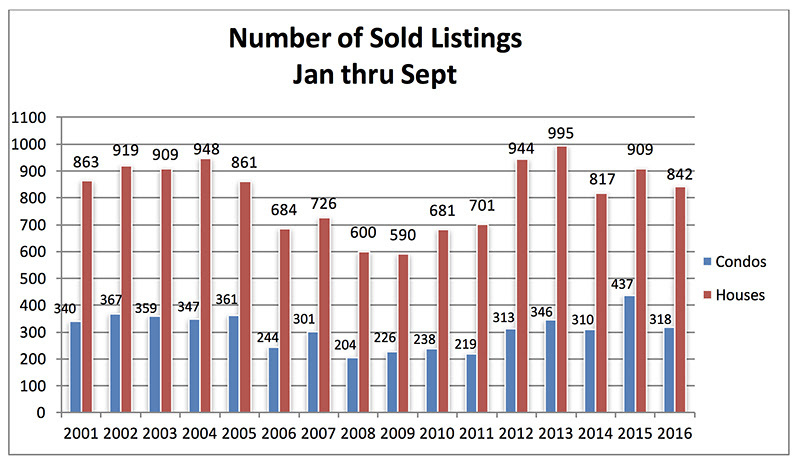 The number of pending listings now compared to the beginning of the year is up around 53%. If there had been more pending listings, the MOI would reflect a lower number overall. As a matter of information, the following table compares the number of closed sales of houses over the last two years, by price range. The properties under a million dollars are a smaller percentage compared to last year and the $1M-$2M is marginally higher. We do see a jump in sales for those properties between $2M – $8M. The over $8M category is down compared to last year. A slowdown has been noted in this range. It is interesting that there is a two percentage uptick of the inventory for properties under a million dollars compared to last quarter. The only other range that is noticeably different is the $4M – $8M which is down more than two percentage points. This may be partially due to sellers taking their properties off market, removing from the Multiple Listing Service after they have been exposed to the market for an extended period of time. The Feds have yet to raise the Fed Funds rate. There is a strong feeling that they will do so in December, as they did last year. As for now, mortgage rates still remain very low and affordable. It should be noted that if and when the Feds raise the Fed Funds rate, it does not guarantee an automatic raise in mortgage rates. Leslie Appleton-Young, the Chief Economist for the California Association of REALTORS, had an interesting perspective: The market is being affected by many of the Baby Boomers. They are not moving as often as they may have done in the past. They like their low rate on their current mortgages and are enjoying lower property taxes. They do not want to have to deal with the capital gains tax if they consider selling. If retired, they may not qualify for a mortgage today, so they tend to choose to remodel and stay where they are. A survey she conducted indicated that over 64% of Boomers do not plan to sell their homes when they retire. She also determined the percentage of the affordability index; i.e., what percentage of people could purchase a median-priced home. For all of California, the affordable percentage is 31%. Kings and San Bernardino counties have the highest at 56%. San Francisco has the lowest at 13%. Santa Barbara county is at 20%. Another trend that she noted is that there are fewer and fewer international buyers across the United States. This became most evident with China’s impending recession. In 2013, 8% of the buyers were international. In 2016, only about 3% are international buyers.